HomeFeaturesNews FeaturesIs the proposed loan system the only way to fund third-level? To pursue the job of your dreams, there is a pretty good chance you are going to need a degree to get there. As the scrap for college places continues, the government also continues to raise the cost of fees for those lucky enough to land a place in a third level institution. 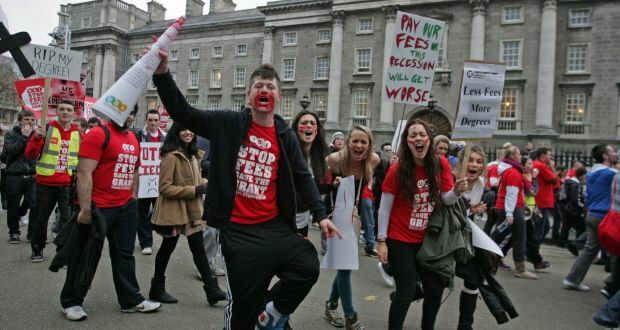 As it stands, we pay €3000 in student contribution fees every single year. While we are all aware of this and the strain that it can put on our families, what you might be surprised to learn is that we pay the second highest cost for college in Europe. Currently, there are over 100,000 students in third level education in Ireland. While we have a student grant available, this is awarded on different tiers and could see some students qualify for maintenance and not fees, or not receiving enough to get them to and from college. In 2014, 105,000 students applied to Susi for a grant– 75,000 received it. The sheer number of applicants is a clear reflection of the need for something to change within our borders and make college more accessible for people who have qualified to attend it. It is fairly safe to say that if a student loan scheme was to be instated, akin to the one the UK has in place, it would certainly be availed of. In the UK, you can apply for a student loan that will cover all of your fees and you do not pay a penny back until the April after you have graduated. If you assume that students go to college in order to gain employment that would not be possible without a degree, there’s a pretty good chance that after they graduate college they will get a job where paying back a loan isn’t as much of an issue to them. The repayments are deducted from your wage and will show up on your payslip so you do not have to go to any effort. On top of that, if you somehow come into money while studying in university, you can pay off a part of your loan in advance if you wanted to. The system allows anybody who qualifies to get in to attend college and it is easy to see how it could benefit us here in Ireland as well. However, it is important to note that our neighbours pay up to £9000 (Around €10,000) per year for fees which can create a staggering sum to repay down the line. If the fees continue to rise here in Ireland, a loan system not unlike the one in the UK may be what we need in order to continue turning out a highly skilled and well educated workforce.